what should volume IV have more of? less of ?? However, I really enjoy doing bitwise puzzles. I rarely get the chance to do them, and I wish I could do more. Also No-op puzzles are really enjoyable. I too hate anything with a zero! Like single operators........exponention puzzles.........love the twins......as I said in a different forum, I find the negative numbers very difficult to do on paper (as I mentioned before, they would be more do-able on a computer screen).......also like the no-ops.......and not too keen on the really large puzzles.......my comfort zone is up to the 9 grids......10's are doable but take me much longer........almost forgot......really like the multiple operators ( +, -, x, divide again in the 4- 9 grid range)........the big twins are harder but doable......I guess it could be said I enjoy doing any twin including the no-types.......as far as mod and bit-wise goes, I prefer the ones that are less than 50 % mod or bit-wise.......I need more numbers to help figure them out.......the 11 grids were a bit easier than the 12's.......but again were difficult for me.......even though volume III was 2 years ago, I don' think my skills have improved much as the puzzles of 10 or more grid patterns still require (most of the time) much more time........there were no "killers" in the last book and I hope the next one won't have any either....also, some "tricky puzzles as in "201 Trick Puzzle" book of 2012 would be a good addition. My favorites are the twins. I also like single operators, bitwise or, (how about bitwise and & xor? ), patterned puzzles. I think you had one puzzle that was a 9x9 bitwise or. I really liked that one. Not a big fan of modulo. For the extra-large puzzles (15 and 17), it would be nice to get extra points, just as you do for the extra puzzles. I thought the mix in volume III was pretty good. But I like the suggestion of extra points for the extra large puzzles. They generally take quite a while to solve, so some extra points for the extra effort involved would be welcome. 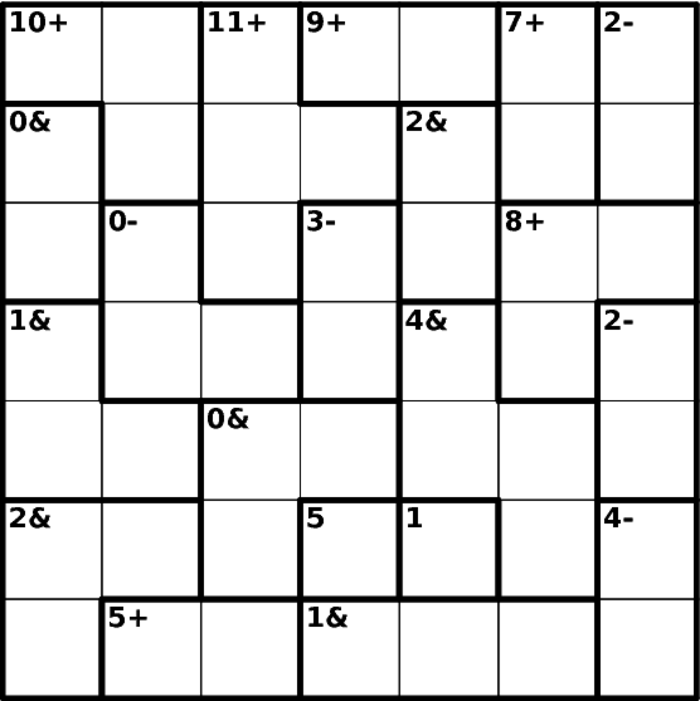 It's a puzzle from 0 to 6 and the & operator is the lowest number in the cell? Also, does this mean that my user puzzle is coming up soon?